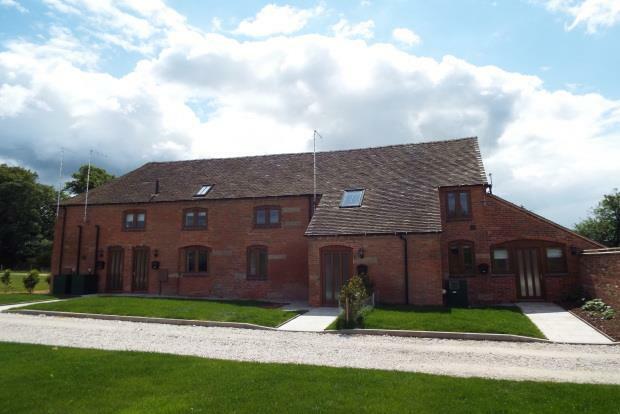 1 Bedroom House To Rent in Uttoxeter for £695 per Calendar Month. Accommodation in brief; entrance to hall with large storage cupboard and access the living room, bedroom and bathroom. The kitchen diner is off the living room and is fitted with contemporary wall and base units and includes integral oven, hob, fridge, freezer, washing machine and dishwasher. This kitchen is finished to the highest of standards. The sitting room is a good sized, light and airy room with a door leading out to the communal yard, and has an electric living flame fire inset to one of the walls. The bedroom is carpeted and the bathroom has a white suite with shower over the bath with glass shower screen and heated towel ladder. Externally just beyond the barns is a private, pretty walled car park where there is parking for 1-2 cars per barn. 2) Oil will be billed every 3 months following a meter reading being taken by the agent, tenants are able to check these readings themselves. The cost of oil will be calculated from the last oil invoice.